Now is the "PERFECT STORM" for buying and renting foreclosures. This is the PERFECT BOOK at the PERFECT TIME. In 2005, Joseph Neilson, author of this book, was 61 years old, when he started investing in real estate. No job or pension and with Social Security still five years away, he needed steady monthly income NOW! Cash flow was the priority. He searched for a real opportunity, not a get-other-people rich charade. Almost by chance, he bought a rental house. Easily the best decision that he has ever made. Seven years and 62 houses later, he makes $22,000 a month and has $3 million in equity. This new book shares what he learned and exactly how he did it, including all info about properties, cash flow and the actual numbers. Hard to believe? Of course! Joe is the real deal! In Chapter 20 of this book, Joseph offers a full disclosure, 13-column spreadsheet that is down to the dollar--the first real estate book to do that! This may be the opportunity you've been searching for. In addition, in my opinion, one of the biggest "under-advertised" benefits of getting Joe's book, is that it has TONS of great Landlording strategies that delves into street smart landlording tactics and realities that most property management books don't cover. We like Joe's ideas and book so much, he was invited to speak at our last MrLandlord.com Convention and our Landlord Cruise Conference. His book was a big hit at both places. PLUS receive a FREE bonus booklet - "THE REHAB BIBLE: Step by Step Instructions for a lifetime of PROFITS!" 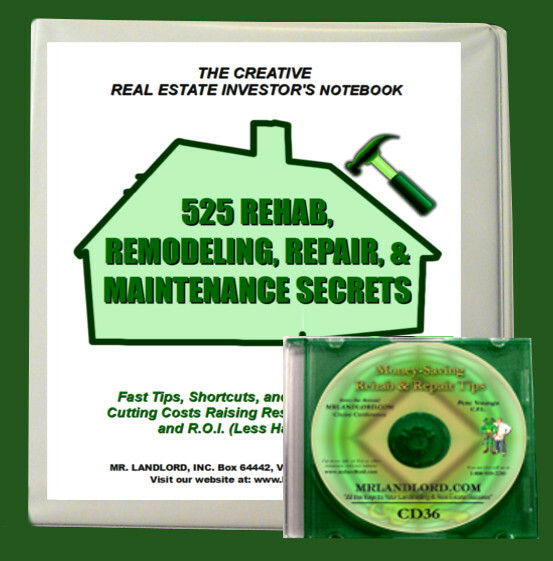 This booklet reveals how to inexpensively rehab a rental. Learn how to eliminate maintenance headaches! The author's philosophy is, "Do it once...Forever". The regular price for Buy and Rent Foreclosures was $24.95. Mrlandlord.com visitors can receive a 20% discount when ordering Buy and Rent Foreclosures, PLUS receive the FREE bonus booklet, "THE REHAB BIBLE" (a $10 value). Total package price is $35. You can order now for only $19.95 with FREE shipping!